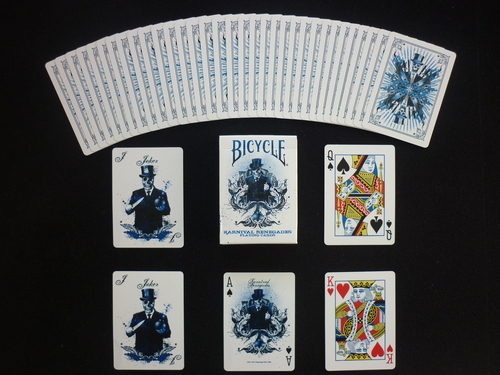 Apart from the prime colour (blue), the Karnival Renegades deck is very similiar in style to the Karnival Assassins. Consistent with the series so far, the back design is subtly one-way backed, and the box features a bar code reveal. The artwork is also done by Sam Hayles. Comes with two custom jokers (one of which features a reveal), a custom Ace of Spades, a double backed gaff card, and an ad card with a reveal/prediction printed on one side.